The winter sun cracked a beam over the top of our eastern hills as I squeaked down the trail through the new fallen snow. Molly, our 80 lb Pyrenees, did her best to pull my arm out of it’s socket. She may be small for a Pyr, but she still does an impressive impersonation of a sled dog, with me as her sled. 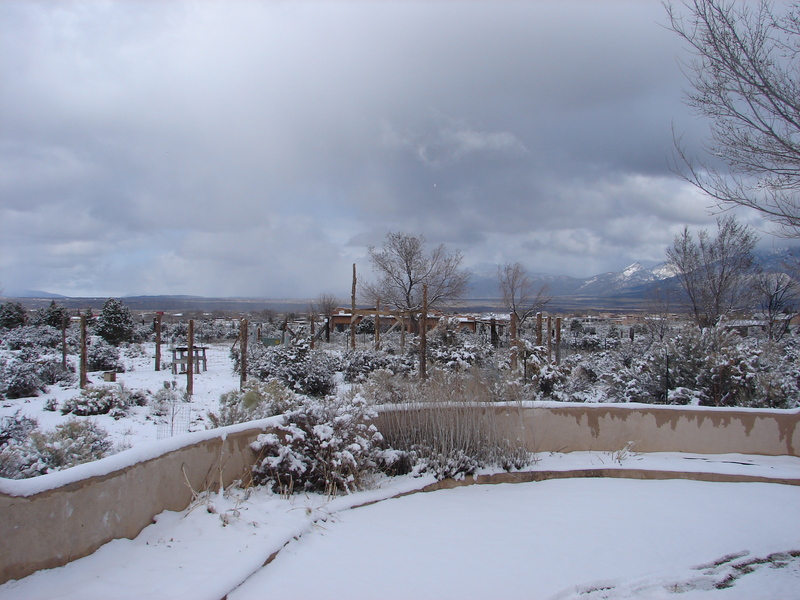 It was 9 degrees and still, the NM sky a pale, early-dawn blue, the color of Easter baskets. I took in a deep, lung searing breath of crisp, desert morning. Then my mind turned back to it’s mastications…. Randy will go to the mill and get the siding… 1×8’s and 1×4’s….what lengths? I think 8′ and 10’ers…. I need to pick the meat off the rooster for the stew…. chop the veggies and get things simmering…. hope we have enough avocado… will anyone even show up on such a cold morning? Could my friends love me THIS much? I bet no one shows…. I’ll just freeze the rest of the tortilla soup…. Well, apparently they DID love me, evidenced by cars pulling into our muddy cul-de-sac just after 10. RG and Donna arrived first, hefting tools and tool belts out of the hatch. Randy returning next with the lumber, then Jim and Ray, then Jeremy…. I was a bit overwhelmed by this incredible display of support! It had been years since I had thrown a work party. 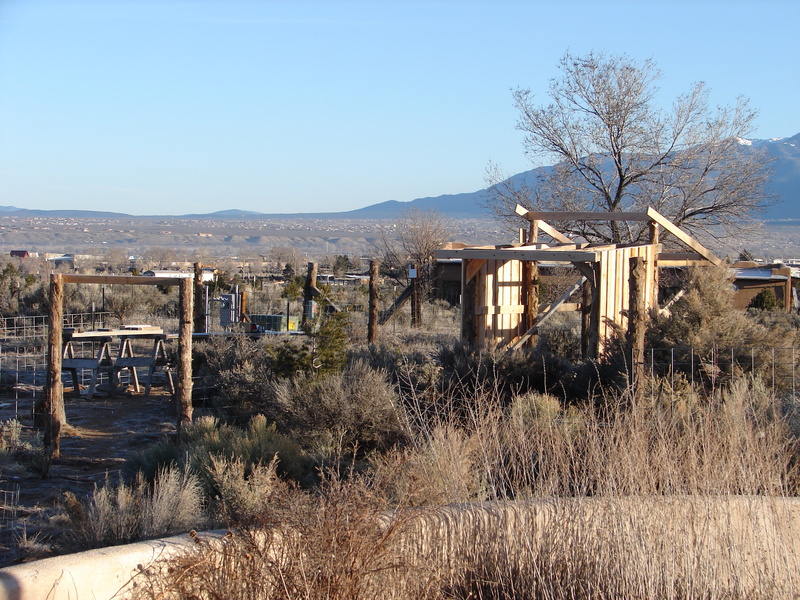 While building our straw bale home, there had been several BIG work parties: the slab pouring, the wall raising (stacking of the in-fill bales), and 2 exterior mudding parties. The loft pony walls still show the slight wobble of a keg tapped a few hours too early. Damn those days were fun! 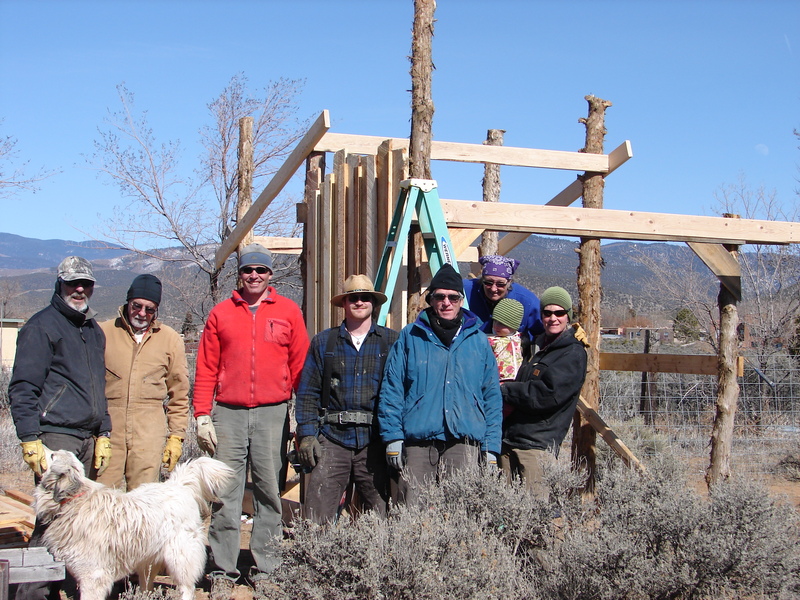 But this time our dear friends were not arriving to help build OUR home, they were here to build a home for our goats. My other friend was late to pick up Isla and I was trying to figure out what to do with her while the assembled crew told bad jokes and floated their teeth with hot coffee. The ironic thing was Kiersten, who would be taking my 2 yr old to support the work party efforts, was late because she was at the farm where our goats were! Why? She was midwifing out the last of the herd’s kids, along with the farm owners and their 3 collective teenage girls. Kiersten had also caught OUR two babies (the human ones), as midwifery is her full time job! So as I had a quick goat check-in with the Pieper’s to see how our goats, and the laboring mama, were doing this morning, they filled me in that Kiersten was there assisting. And when Kiersten arrived at our farm, covered in goat poop and afterbirth, she filled me in on our goats and the final kidding of the spring at the Pieper’s farm. Sadly, one of the triplets was stillborn. She had even tried to resuscitate the little buckling but he had remained slimy and still. I felt bumbling and odd clipping on my old, stiff tool belt. It had been a while – full time mommys don’t get much time to hammer nails. 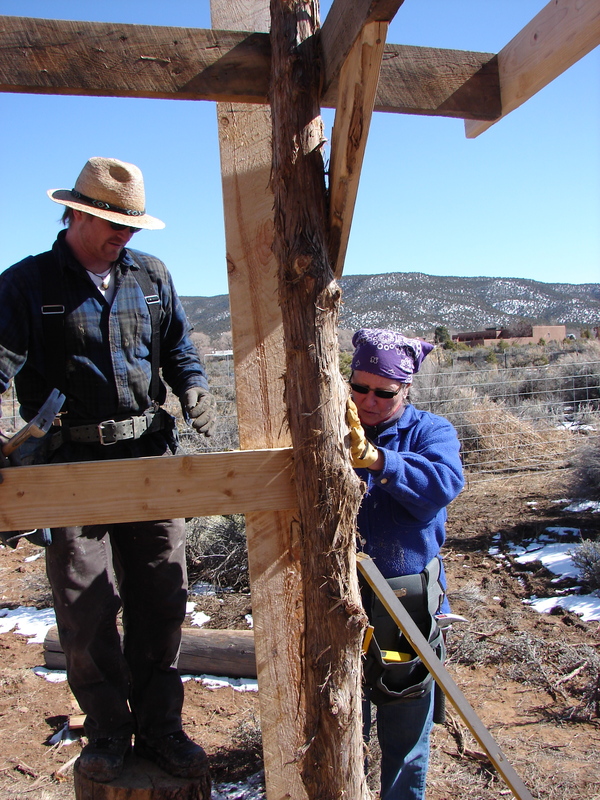 Then Donna, designer/builder extraordinaire, my mentor and clone, said the dreaded words…. “Hey Mac! Where are the plans?” Plans? Ha! PLANS? Hee! What was wrong? Couldn’t she see them all neatly there in my mind? I had been planning and redesigning this barn, in my mind, for a couple of years! “Well, uh, ya see, Ranger D…. I was stressing out about that just the other night I was! Where are those plans? And, ya know, after YOU (I turned an accusatory eye at innocent RG) wiped our laptop for us and loaded those recovery disks, well, I just haven’t gotten around to reloading ACAD. And then I had an epiphany, in those wee hours of the night. And a voice said to me….. it said… ‘IT’S AN F’ING GOAT SHED FOR CRYING OUT LOUD! STOP DESIGNING AND START BUILDING!’ And so… we are!” I turned away from 6 blank faces, cleared my throat, and bent to pick up some 1×4’s, groaning as I stood back up. Fortunately, I heard a few chuckles in my wake, and the design challenges were successfully worked out in the field. As I had planned, all along… in my head. 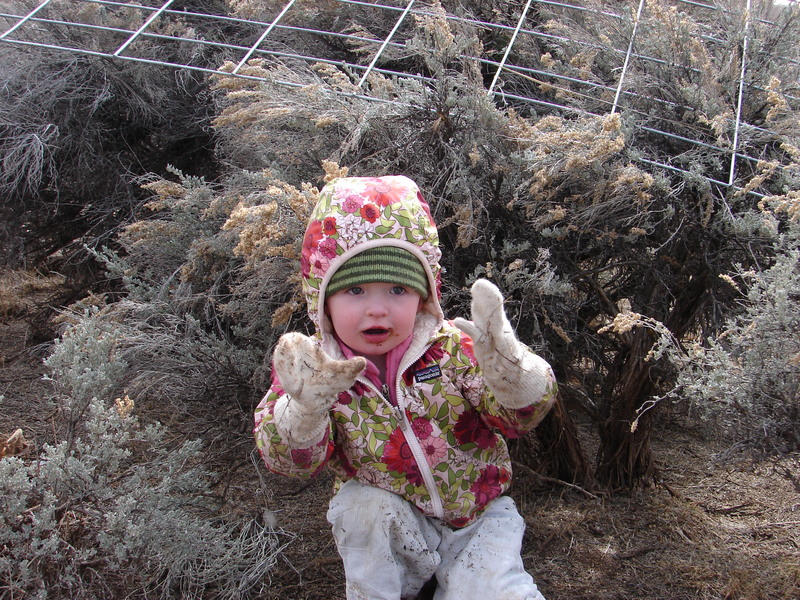 I felt guilty as I tiptoed off through the sage brush to the back porch and scraped the 5 lbs of adobe mud from my rubber boots. I should be out there with everyone screwing, hammering and sawing…. laughing and joking…. telling stories while passing a handful of fence staples to a good friend. But then who would make lunch? Back to the kitchen with you wench! Well OK. I’ll chop these veggies and stir this soup and set this table, but don’t forget I built my own house! 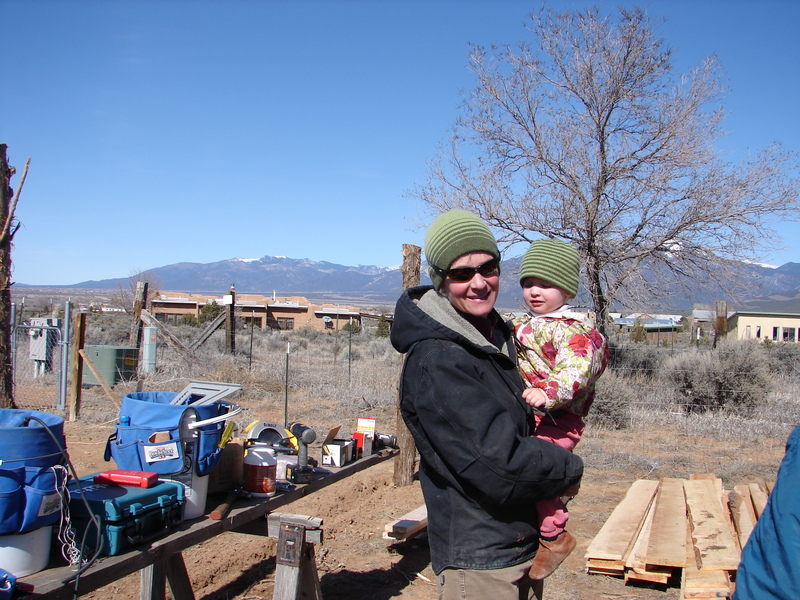 (Many, many, many aches and pains and years ago) Well, I did build the chicken coop two years ago! (Please don’t look too closely though.) I think one of the sweetest things I heard all day (other than car tires crunching up the driveway), was Randy, at the end of the long successful day, who lovingly said, “Honey, I know you wanted to be out there with us, but what you did – preparing the meal, getting Isla out the door, getting her down for nap when she returned, and washing dishes while she slept, was equally as important. This day would not have happened without your efforts either.” That man is a keeper. I brushed away a little tear and kissed him on his stubbly cheek (his beard always grows super fast when he uses a chainsaw… which he had). 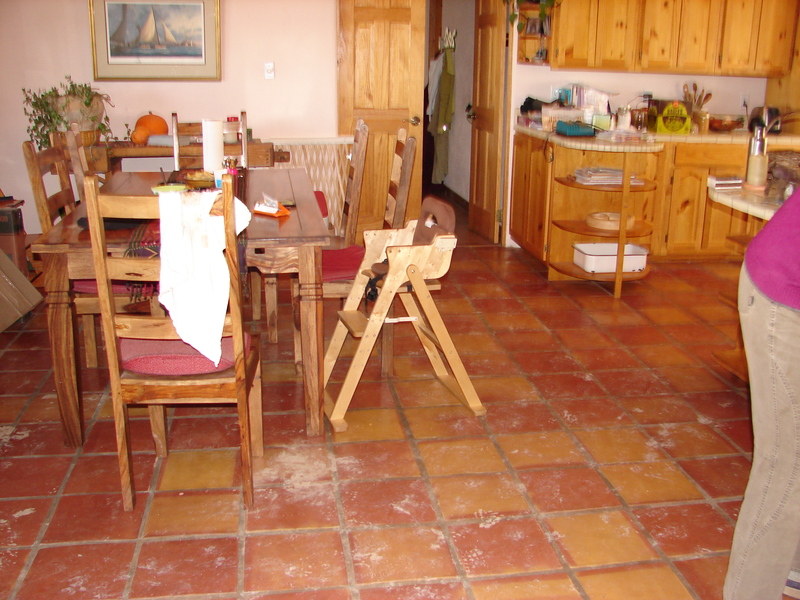 And by the end of the day the house was an impressive disaster, with an inch of mud on the saltillo tiles and a leaning tower of bowls on the soup smeared counter. But outside, oh my! It was beautiful! 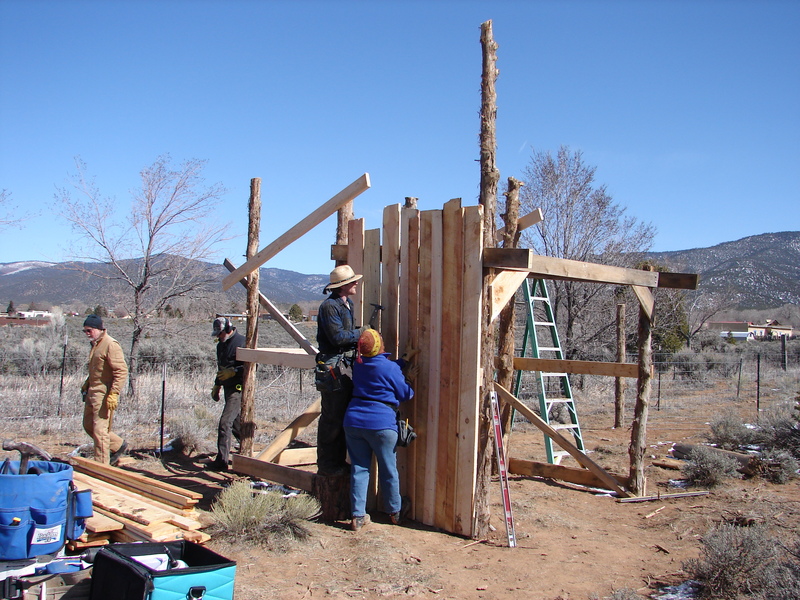 About a 1/3 of the stock panel fence was attached to deeply sunk cedar posts, pole barn roof structure was in place, rafters on the south roof, and board and batten siding on 1/4 of the walls. The freshly milled, green wood shone in the setting sun. It had been a very good weekend. One more weekend like this and I think Hazelnut, Fiona and her cousin or 2 can come home for good. I can almost taste the goat cheese! After setting 4 posts by hand the previous weekend with RG, THIS weekend Randy rented a working auger! Here are the 6 poles for the first module of the barn. 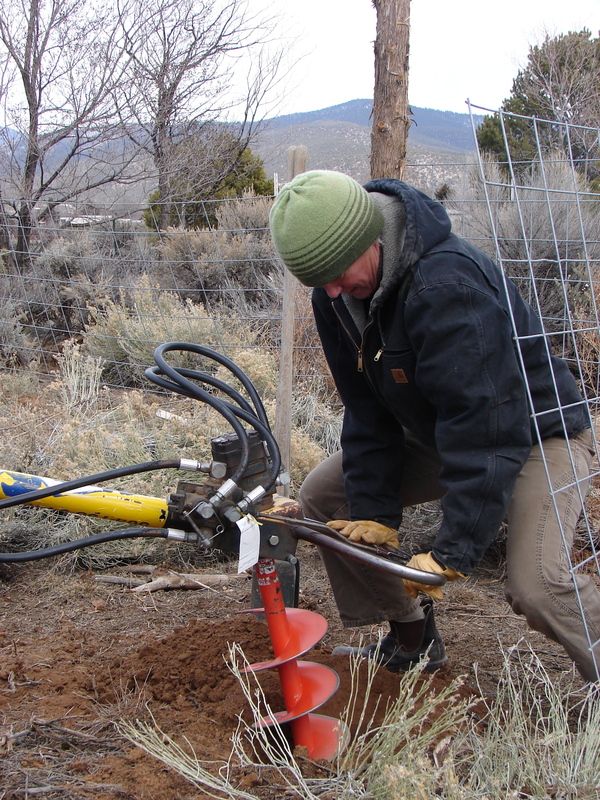 Digging bars are essential once the layer of caliche is hit. Fortunately the auger sliced through it with ease, although adjusting the location of the hole was often done by hand. 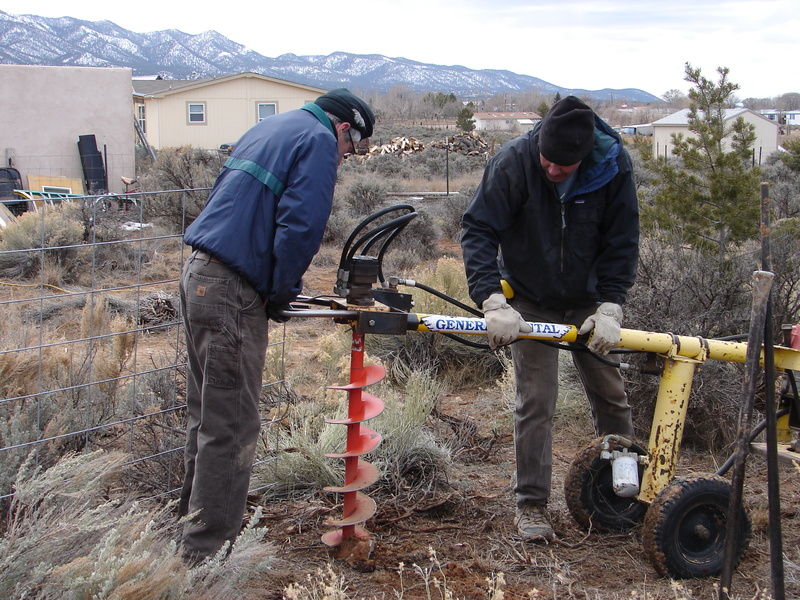 This digging auger was a life and back saver! 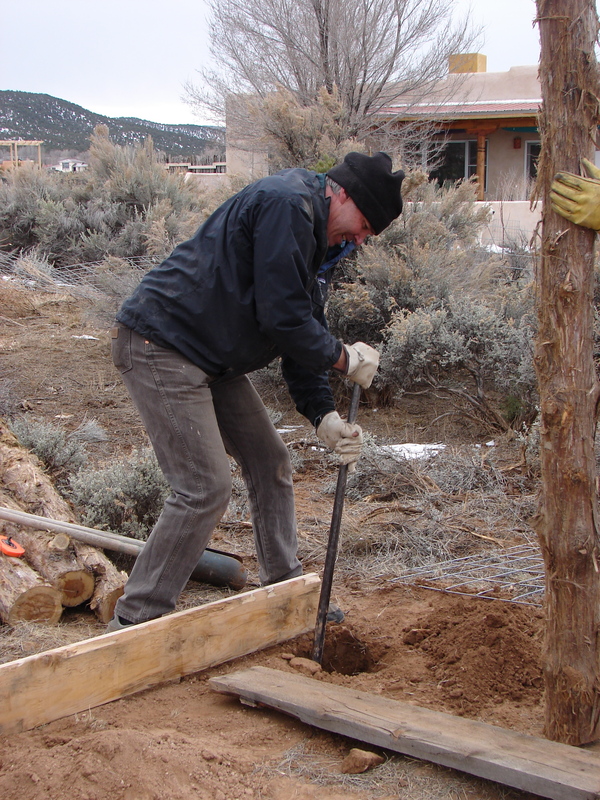 Here Randy and RG dig their umpteenth pole hole (I think there were 19 posts total for barn and pen, but they actually DUG about 25 holes due to misunderstandings and changed minds). Here I am giving the auger a try. Niiiice! 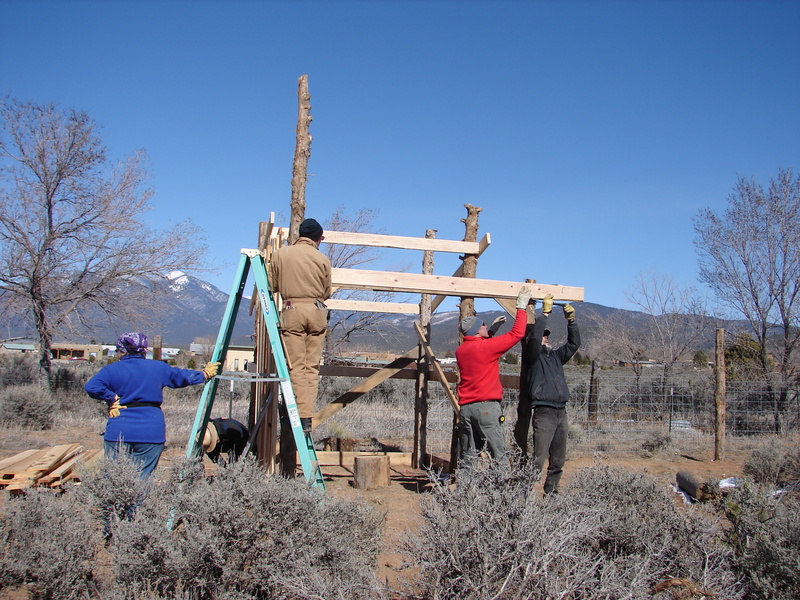 Randy and Ray help plumb the post for Jim. I am trying hard to ignore the mud and debris on Isla's hand wash only wool mittens....I succeeded. Day 2 of the 3-day project weekend. Beautiful but frustrating. Randy took advantage of the down day by hauling home more lumber, hardware and stock panels in preparation for the following day of clear weather. Donna, Jeremy and I discuss the lack of lag screws. 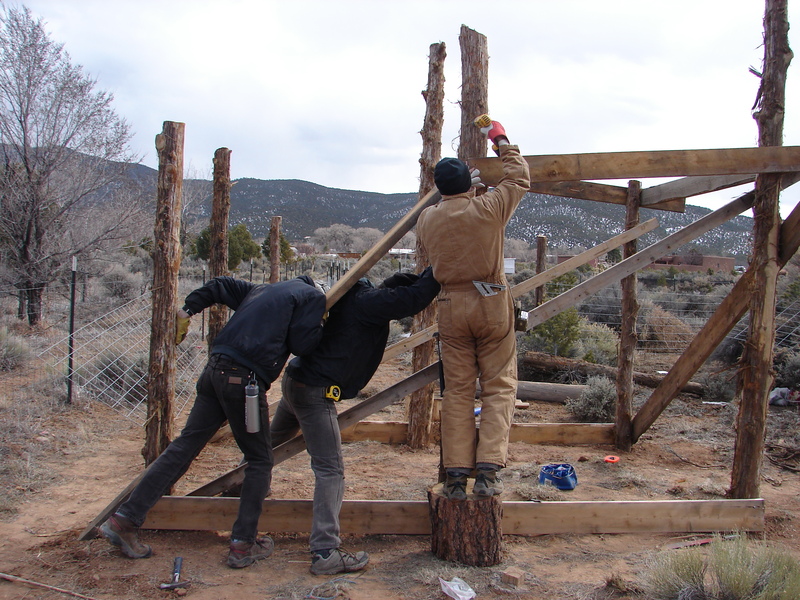 Fortunately the can of old pole barn nails from our strawbale house building days sufficed. 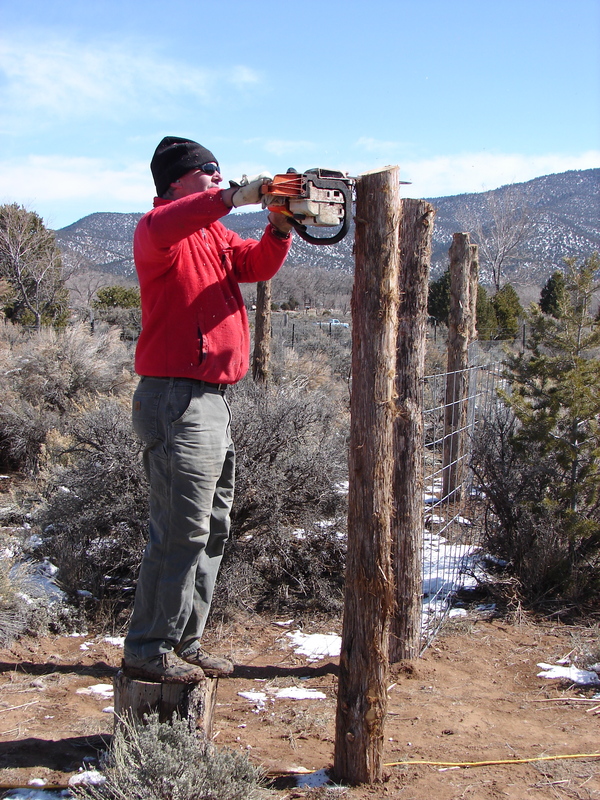 Randy lops off the post tops with the chain saw. The round of wood he is standing on is part of the goat playground. They also work great as step ladders. Donna and Jeremy rockin' on the siding. They made a great team! And just to prevent any gossip - they met that morning, Donna is happily married to another lucky fella, and is actually old enough to be Jeremy's mother! 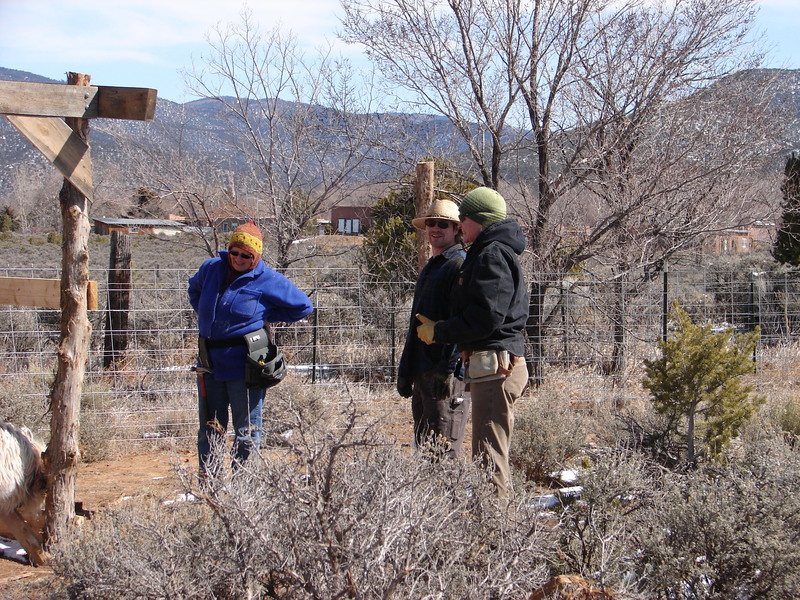 Randy gives Jim and Ray a hand on the facia board while Donna steadies the ladder. Whether goats or humans, I am a mama first. 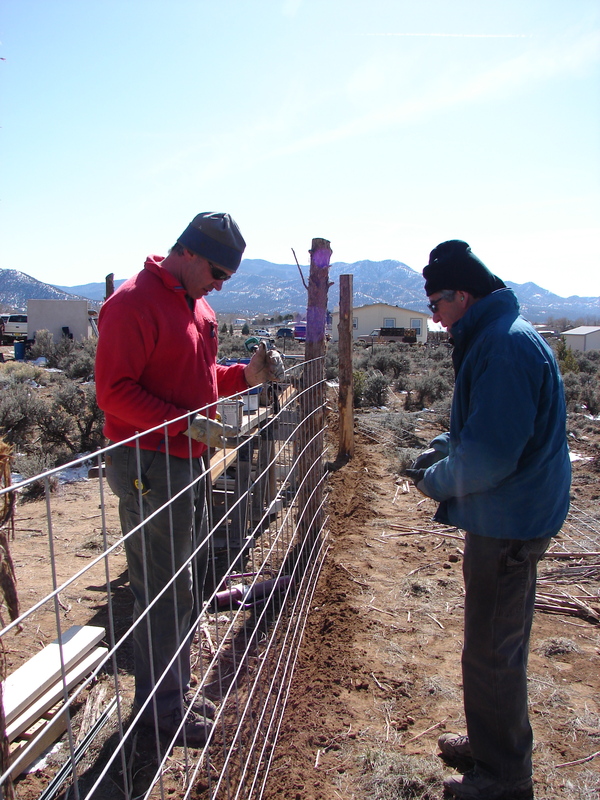 Randy and RG working on the pen fence. For goats, you need nothing short of a fortress. This 16'x50" stock panel is 6 gauge. 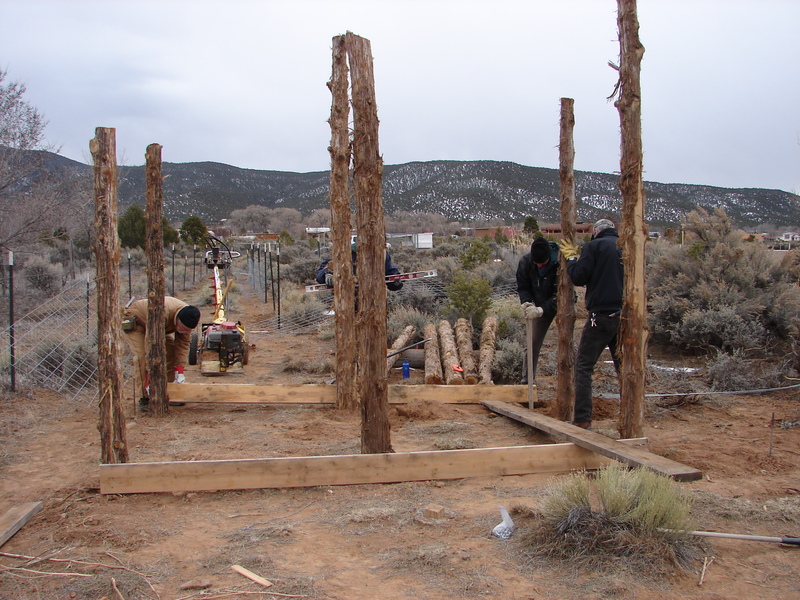 We will also dig down 12 or more inches to bury more fencing (I haven't yet decided what kind), wire 36" of 18 gauge stucco netting to the bottom of the panels, and string several runs of plain wire above the panels. In my opinion I should not have goats unless I can keep them in their enclosure and keep predators out. The goat gang, mid afternoon on the second work day. From left to right: Ray Baker, Jim Watson, Randy Roch, Jeremy Jette, Randy Grubiss (RG), Donna Lefurgey, Isla Roch, MacLaren Scott. The morning after at quiet sunrise..... the first of the 5 modules, so near to completion. The clerestory will bring light and solar gain into the double 6'x8' stall at the back of the barn. The front 6'x8' "lounging porch" will have double barn doors in case of bad weather and space for the milking stand. It might be small, but by god, it IS a barn! Yeeee hawwwww, Mama! So happy to read about the weekend and see the progress! AMAZING! What community! We nearly came yesterday, but I was wanted to ground after Santa Fe. And we were going to come today, but that was at 2pm and I assumed Isla was napping. So so excited to see your dream manifesting AND to learn from you in case we get goats someday! PLUS, I’m most excited to selfishly consume your goat’s milk and cheese and play with them! xoxothanks for sharing! Well, I was thinking if I get 2 doelings that I would raise one of them for you to take next year. What do you think Mama? XOXO Love you Honey and all you are doing to support the manifestation of my DREAM!! No, YOU are the best!